Learn the ins-and-outs of the goal-setting process. When we think about people who are successful, what do they all have in common? They are all great at setting and achieving big goals! Because by setting goals well, you can achieve your big goals. Setting goals gives us a target that moves us forward while staying focused and motivated. Though setting and managing goals is a rewarding process, it can be challenging to manage, especially at the workplace. As a manager, your success depends on your team’s ability to deliver. Let’s say you’re the VP of Sales and your goal is to, “Make the company sales target for Q1.” In order for you and your team to achieve the sales target, you all must understand the what, when, why, and how of goal management. What will help you stay on track so you achieve your Q1 sales target? 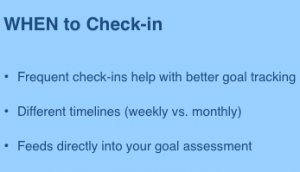 When should you check-in with you and your team’s goals? Why should you assess your goals? How can you easily repeat this process for every goal you set? WHAT – What helps you stay on track to reach your goal? The first step in any goal setting process is to clearly state your goal, important metrics you need to hit, and by when. As the VP of Sales, your goal clearly states you want to make the sales target for Q1, so the next step is to determine your specific metrics. Clear and measurable metrics will not only help you stay focused, but will also help you track your progress. 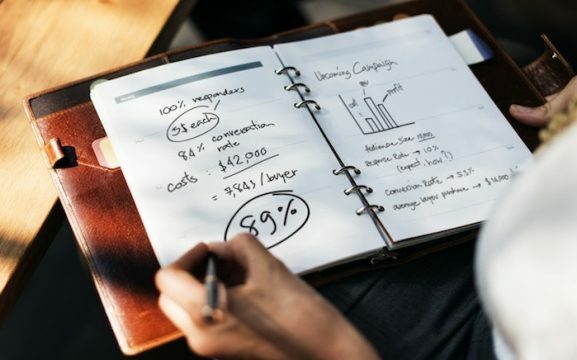 If your goal is to achieve Q1 sales target, let’s define your metrics as “$7 million in closing” and “75% of sales representatives will achieve their individual quotas.” These two metrics will help you to stay on track to achieve your Q1 sales target. In addition to setting measurable targets for your goal and metrics, you must also indicate the timeline of your goal (start and end date) to achieve them. The timeline of your goal is one quarter, or about 3 months out of the year. This helps keep your goal specific, measurable, and time-bound. Once you assign a timeline to your goal, the next step is to define a check-in frequency. WHEN – When should you check-in with your progress? Setting a cadence for your 1:1 meetings to update your goal progress and to discuss your goal with your manager and team members is a crucial step towards achieving your goal. Regular updates will help everyone in your organization track your goals’ progress as well. Since your Q1 sales goal has a timeline of one quarter, you can schedule weekly check-ins. Frequent check-ins will help keep your 1:1 meetings laser focused by providing an opportunity to discuss course corrections, timeline or target adjustments, as well as determining if the metric is still relevant. It’s important to make sure that your goal is still attainable and relevant to the overall team, department, and the organization. Click here for more information regarding SMART goals. 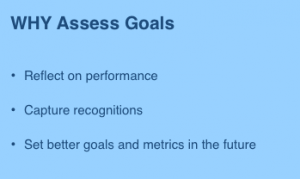 Goals that are active, past their timeline, or have reached their metrics, should then have a goal assessment. WHY – Why should you assess your goals? Think of goal assessments as your final check-in. The assessment helps you reflect on your performance, receive recognition, and record lessons learned. Let’s say at the end of Q1, you achieved only $6 million of your $7 million sales target and over 80% of your sales reps achieved their target, even though your target was 75%. In this case, you didn’t make the first metric, but you exceeded your second metric. When you reflect on your goal during an assessment, look back at your check-ins and try to understand what went well and areas where you can improve. Perhaps your target of $7 million was more of a stretch goal, when achieving 85% of that would still be considered a success. Similarly, if you are reaching 100% or more of your target all the time, you should consider setting more challenging goals. Additionally, assessing goals is critical when it comes to the annual performance review process. By having regular goal assessments, you ensure your year-end review is based on your performance throughout the year, instead of once at the end. Your overall performance will then translate into overall business performance, allowing you to write a quality annual performance review. Goal assessment is an easy, repeatable process once you understand how to do so. HOW – How can you easily repeat this process for every goal you set? 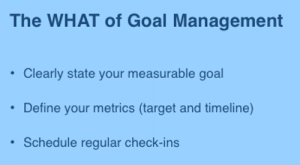 Many organizations use spreadsheets and a collection of documents to record the What, When, and Why of goal management. Unfortunately, this approach limits the visibility of each team’s performance across the organization, which reduces accountability. By setting your Q1 sales goal in All Elements, you can assess and adjust your performance on a continuous basis, set reminders to check-in weekly, add updates to 1:1 meetings, perform goal assessments, adjust your course, target, or timeline, and capture your recognitions. All Elements also provides visibility of each team’s performance, allowing for full transparency across your organization. 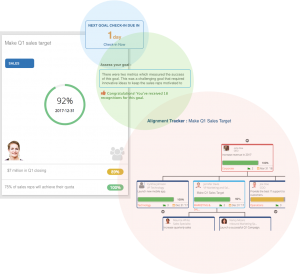 With All Elements’ ability to combine the What, When, and Why, you can set and measure your goals, easily repeat the process, and better your performance all through one platform.